Home › Electronics › Amoner 3Pack 10Ft Nylon Braided High Speed Usb 2.0 A Male To Micro Usb Male C..
Amoner 3Pack 10Ft Nylon Braided High Speed Usb 2.0 A Male To Micro Usb Male C.. Hot Sale Sturdy & Tangle-free Design--Covered with braided-nylon fiber jacket and anodized aluminum shell which is durable and sturdier than the normal lightning cable but also flexible and tangle-free. The braided finish not only looks and feels great but also prevents tangles, increases strength and is easy to carry. Durablilty: A perfect connection with your device, no gaps or static electricity. Copper conductive pins are extra durable and never rust. Super-fast and stable sync and data transfer. 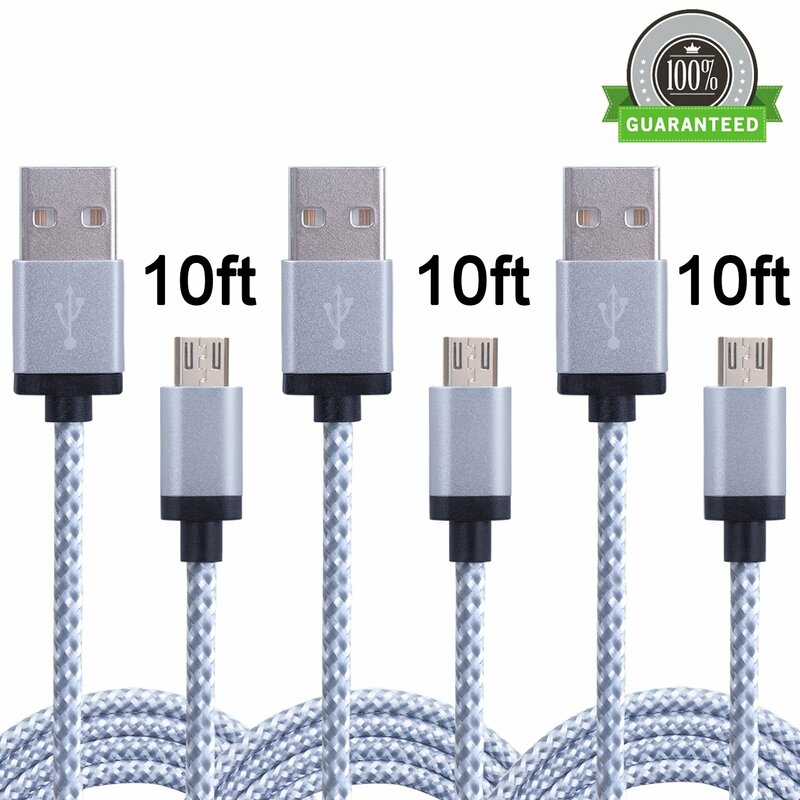 Package: 3 Pack 10FT White Nylon Braided charging cables Micro USB cable. The connectors of cables are smooth, which are easy to clean and long lasting. Amoner 2.0 Micro-USB to USB Cable Sync or charge your devices at high speeds. Extension length means enough reach and more convenience. Compatible with Smartphone, tablet, MP3 player, camera, hard drive, e-readers, externalbatteries, handheld game consoles. All other micro usb connecting devices from brands: Samsung, HTC, Motorola,Nexus, Nokia, LG, HP, Sony, Blackberry and many more. (Not Compatible withApple Devices) It is ideal to use with USB charging port chargers while in the car, officeand home. Portable and storable: Amoner Micro-USB to USB Cable with a 4000+ bend lifespan several times longerthan standard cables can be easy putted in a pocket, bag, purse or anywhereeasy go with. Package and warranty: -3 Pack 10FT White Micro USB cable -Enjoy refund or perfect replacements without any condition within one year. Efficient and always satisfying customer service.